Some people think that except Indian mithai most other desserts need some amount of baking. Yet others think that only baked desserts are exotic. These are simply misconceptions. Across the world, there are fabulous desserts that can be made without baking. 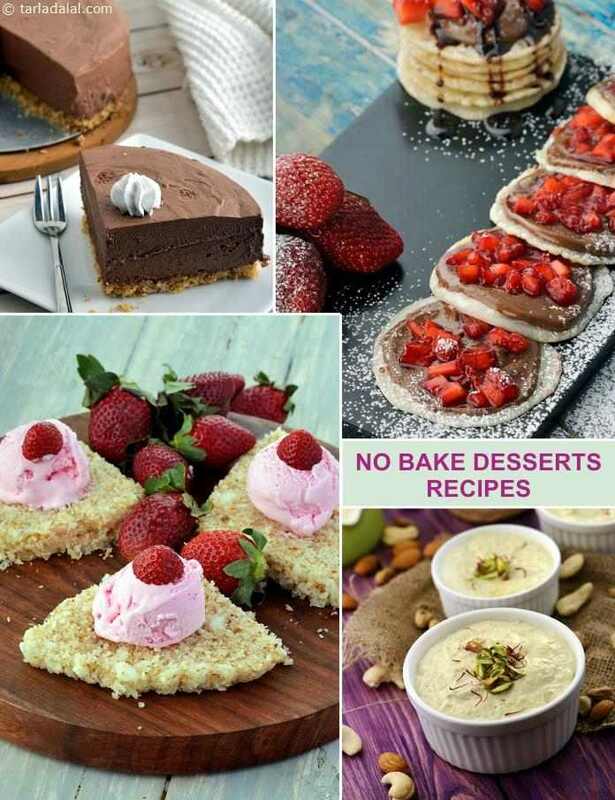 Our favourite no-bake recipes like the Brownie Sundae and the Chocolate Chiffon Pie are totally irresistible, and so are pancake based desserts like the Chocolate Pancakes with Whipped Cream and Nuts and the Nutella and Strawberry Mini Pancakes . Easy desserts like the Quick Strawberry Delight ensure that you surprise even a sudden guest with an awesome dessert, while unique ones like the Ice cream on a Coconut Crust entice your guests with their innovative presentation and irresistible flavour. Kids will go ga-ga over desserts with all-time favourite ingredients like jelly and Oreo biscuits, like the Fruit and Jelly Sundae and the Oreo Biscuits with White Chocolate and Orange Mousse – but beware, you can’t keep the adults away from these delightful treats either. Ultimately, what we say is that it would be nice to have an oven at home, but you don’t necessarily need one to turn out an exciting dessert! Try these recipes, and you will agree whole-heartedly with us.